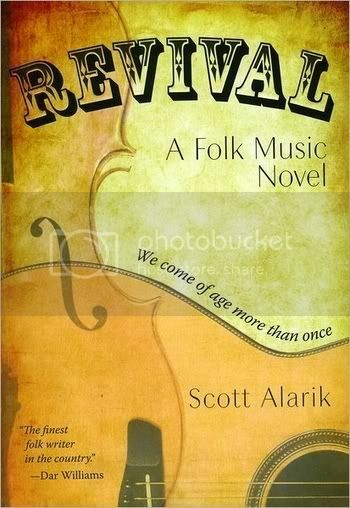 My copy of Scott Alarik’s novel Revival came with a CD that was created as a promotional item for radio stations. On the CD, Alarik reads four selections from the book, with backing music by Jake Amerding. Two of these are passages that advance the story, while the other two are true incidents from folk history that are woven into the book. I find this instructive. Scott Alarik is a folk artist, a writer about folk, (notably in his columns and reviews in the Boston Globe), a teacher of folk history, and a folk coffeehouse impresario. In Revival, all of these Alariks come together in a room, where they are joined by Scott Alarik the novelist. The conversation is lively and sometimes raucous. At times, they interrupt one another, while they also sometimes finish each other’s sentences. The resulting book is at times fascinating, at other times heartwarming, and only occasionally aggravating. I quite enjoyed myself, and reading the book through was a treat. There is indeed a story here. Nathan Warren was once a future folk star who seemed to have it all. But we meet him years later. Warren had been chewed up and spat out by the machinery of the major label system, never to enjoy the success that once seemed so certain. Now, he consoles himself by running an open mike night and a jam session at a Boston bar. One night, Kit Palmer walks in to sign up for the open mike. She is impossibly nervous, but Nathan sees something in her, and she becomes his mission. Revival turns out to be a love story. Nathan finds ways to give Kit confidence, while she finds ways to draw him out of his funk. Along the way, Nathan gives Kit advice about songwriting, and this advice could apply as well to a first-time novelist. Let your characters show their feelings, instead of telling us what they are. Stay on topic, and let your story do its work. Alarick follows this advice beautifully in the scenes where Nathan and Kit are together. The relationship has a wonderfully natural feel, and Alarik remembers that lovers, especially new lovers, do some pretty funny things. The humor in the book is never forced, and it was a wonderful surprise to me. The problem I had was the passages where Nathan was alone. He spends a lot of time brooding, and Alarick does not tell the flashbacks in the same way that he relates the action in the present. This is where Alarick explains Nathan’s emotions, instead of letting us see them. But soon enough, we are back in the present, and Alarick’s storytelling gifts return. Nathan is full of lore about folk music, and this becomes important to the story. But it also takes the reader on some fascinating digressions that I thoroughly enjoyed, but which stop the story in its tracks. I found myself rooting for a fairytale ending, in which Kit becomes a new star, while Nathan finds himself and also the success that should have been his so long ago. But Alarik finds a conclusion which ultimately proves both more real and more satisfying. In the end, Revival is a book that makes me want to seek out Alarik’s nonfiction. It makes me want to hear his music. And it makes me hope that he has another novel in the works, and that he will continue to grow as a writer of fiction. Revival is a better book than it is a novel, but it leaves me wanting more fiction from Alarik the novelist.